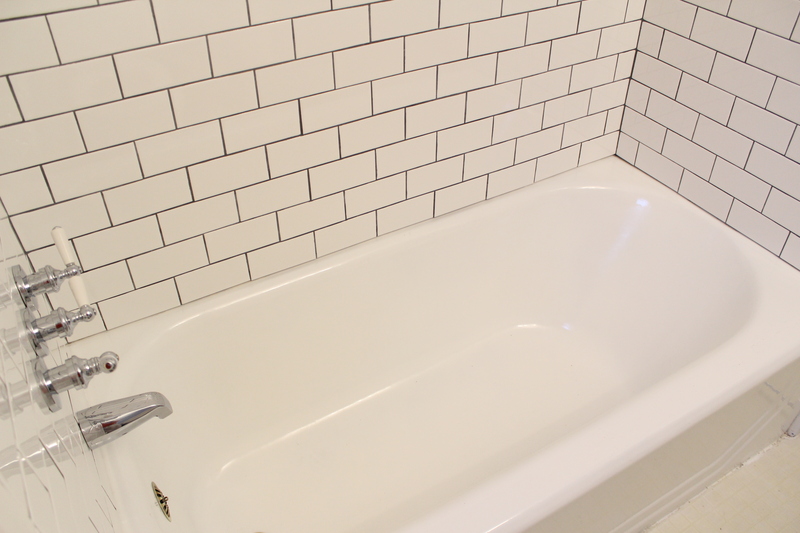 It’s now been 4 months since tiling the bathroom tub surround. 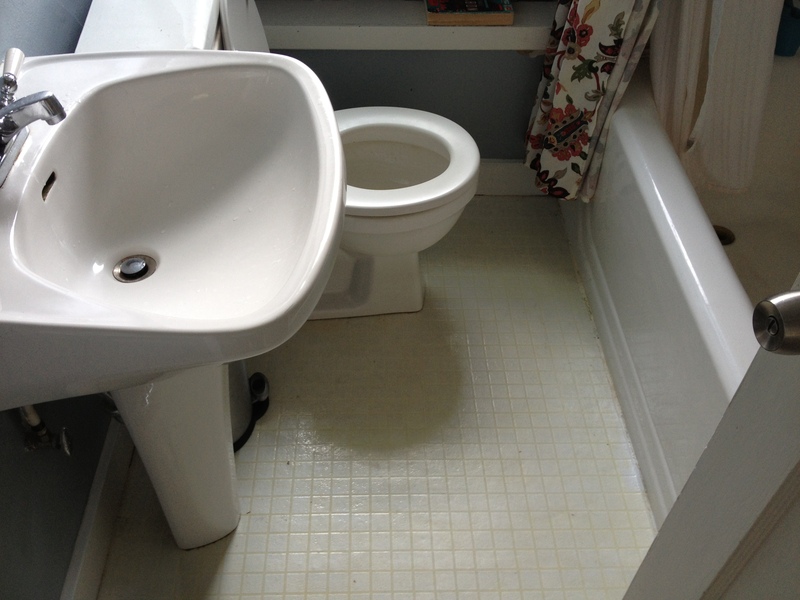 It definitely improved the look of our bathroom, but the job wasn’t complete. We still needed to redo the floors. I went around in circles trying to figure out what to do. 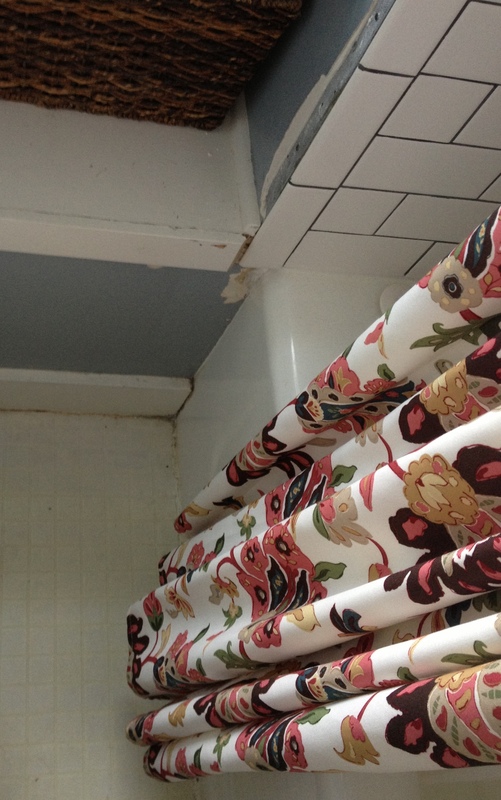 I was a little worried about tile because it’s an older home, so I worry about creaking and shifting leading to cracked grout lines. 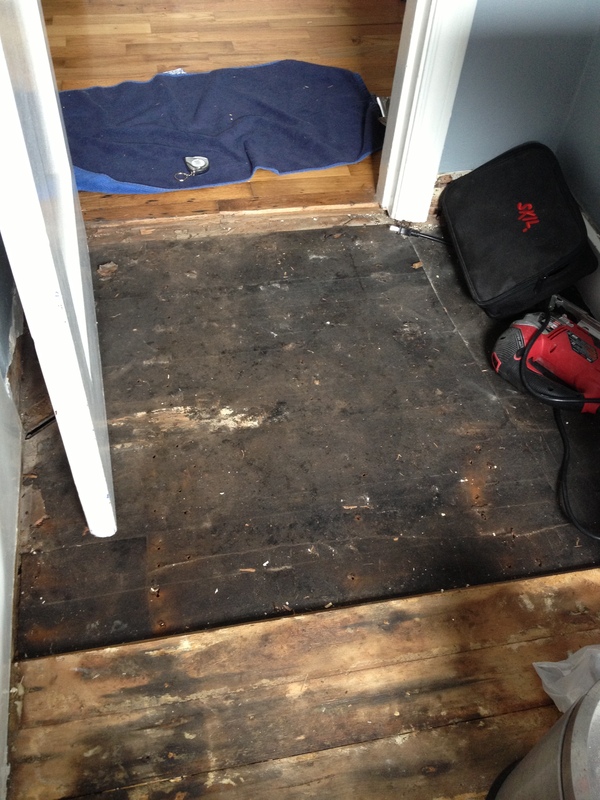 Though if I secure the subfloor properly, it shouldn’t be an issue. It’s also a cold older home…especially in the winter, and I worry about the tile being unbearable in the morning. But I decided some cute rugs could fix that. 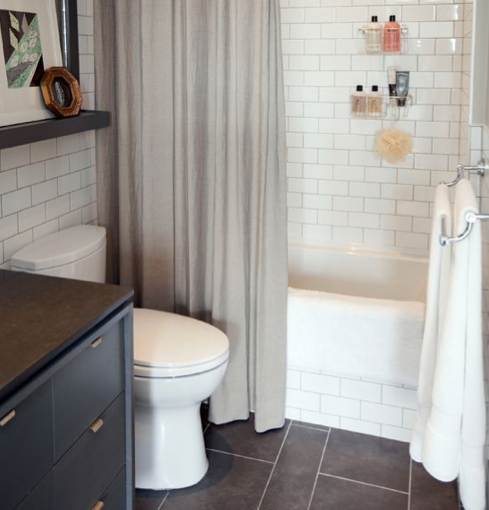 Bottom line is that I don’t like any other option, and I think that a dark floor tile would compliment the bathtub tiling. 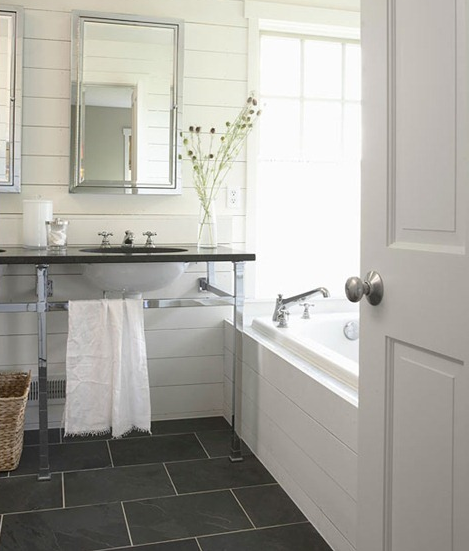 I love the large rectangular tiles running the width of the bathroom. Our bathroom is only 3.5×6.5ft, but I think the dark tile will add a dramatic bold element, and will set off the tile and the white pedestal sink and toilet. Our current floor is a yellowed linoleum. 1. We only have 1 toilet and I don’t know how long it will take until a new one is installed. 2. I have no idea what I am going to find under the linoleum, and there fore don’t know how to tackle it. 3. Did I mention that we only have 1 toilet! But it’s just got to happen, so I just decided I would start pulling up the floor. I’m starting at the door, and will do the toilet absolutely last. I will only take out the toilet once I realize what I am up against. 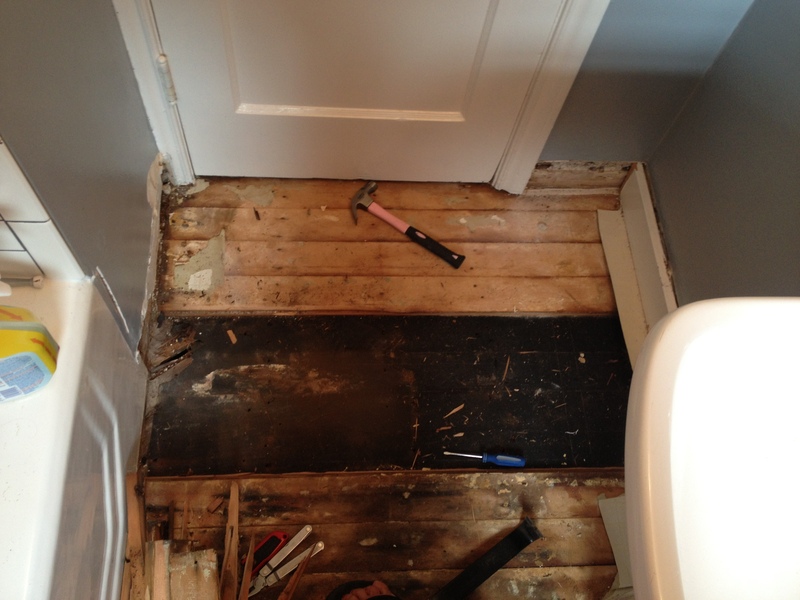 Once the toilet comes out, I basically just have to work on the floor straight until the new one can go in. Each time I think about it, I decided I need a drink. Turns out it’s a very unproductive way of doing things! You can definitely see that there has been water damage. That is something that I expected. 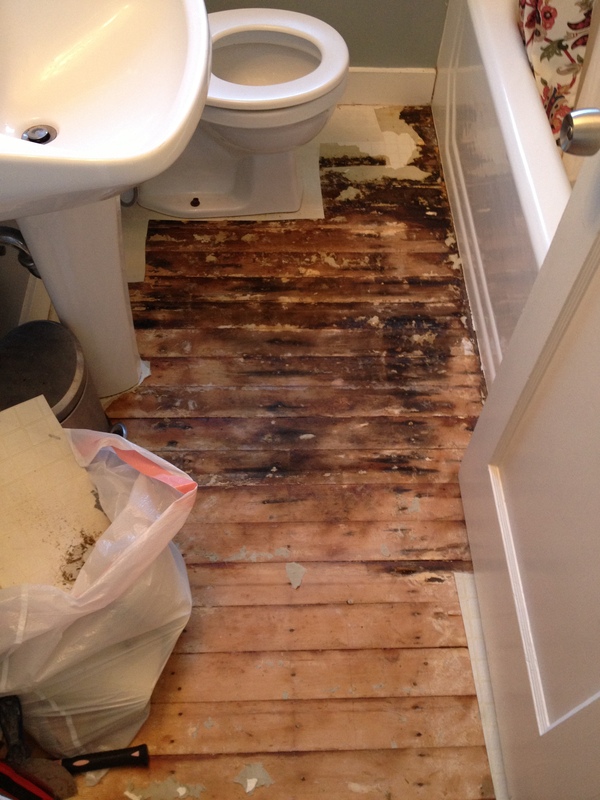 When we had the house inspected, they said that there had been water damage, but that it had been repaired. But this was just the top layer of subfloor. I kind of panicked when I realized that the subfloor was flush with the hardwoods in the hall. It meant that if I wanted to install cement board and tile directly to it, it would add about 3/4 in, which is a pretty high step at the doorway. At the time though I didn’t know that there were 2 layers. 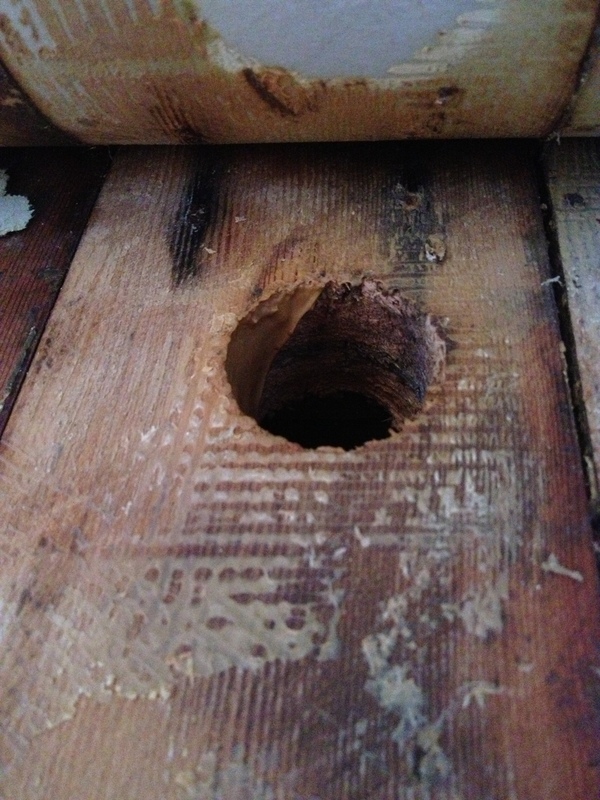 I was very relived to find this hole in the floor that clued me in to the double subfloor. It’s kind of dark, but you can kind of see what’s going on. So, then next step was to see what surprises laid under the top layer of subfloor. There is a layer of tar paper in between the layers of wood, so keep the layers from rubbing and creaking. It’s in pretty good condition. There is one small spot that I have found SO FAR that is rotten behind the door. It was a great sweeping hole :) I’m a little nervous for what I will find as I work my way along the tub and get to the toilet. I’ve made it just to the pedestal sink. I need to remove the pedestal and then will brace it as I remove more of the top sub floor. I’m on a little break as I work on researching sub floors and what I should put down. 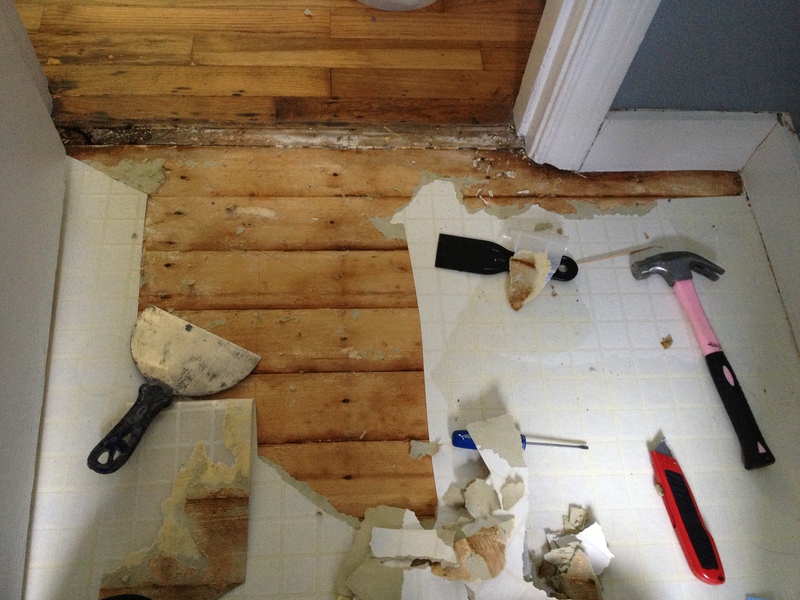 At this point, I am thinking 1/4-3/8″ ply and then the 1/4″ cement board…then the tiles. My progress on new projects is very slow because I have to research each step. I’m also on a temporary hold because I have realized that I can’t do this with a baby in the house. I can’t work around her nap schedule. My parents are going to take her this weekend or next and we will pump this bathroom out! Luckily until then, we have towels laid out across the floor so it’s not all dirty to walk on. Hopefully I will be back within a few weeks on an update…and even more hopeful that I will have a finished bathroom post!